1 – Click on Start Menu. 3 – Click on Performance and Maintenance. 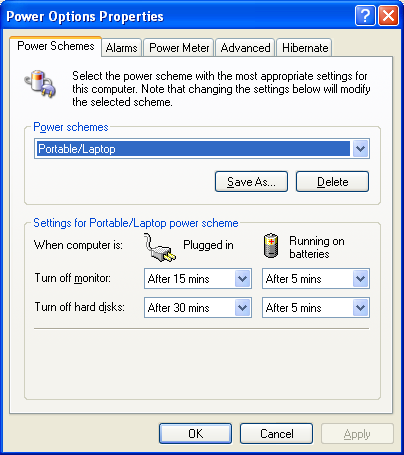 4 – Click on Power Options. This dropdown box contains all the power scheme profiles loaded on your computer. The pre built-in profiles that come with Windows XP are – Home/Office Desk, Portable/Laptop, Presentation, Always On, Minimal Power Management, and Max Battery. These are the actual settings for the power scheme profiles and show the amount of inactivity time that has to occur before the following components turn off – Monitor, Hard Disks, Standby Mode. Changing the Power Scheme in Windows XP. To make any changes to the power scheme settings in Windows XP, you have to be logged on with an account that has administrative privileges. Once you have made the changes to the specific settings on the Power Scheme tab of the Power Options Properties dialog box, click the Apply button to save them.